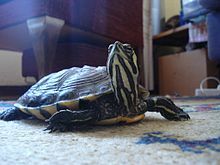 The yellow-bellied slider (Trachemys scripta scripta) is a land and water turtle belonging to the family Emydidae. This subspecies of pond slider is native to the southeastern United States, specifically from Florida to southeastern Virginia, and is the most common turtle species in its range. It is found in a wide variety of habitats, including slow-moving rivers, floodplain swamps, marshes, seasonal wetlands, and permanent ponds. Yellow-bellied sliders are popular as pets. Adult male yellow-bellied sliders typically reach 5–9 inches (13–23 cm) in length; females range from 8–13 inches (20–33 cm). 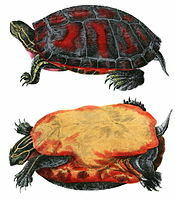 The carapace (upper shell) is typically brown and black, often with yellow stripes. The skin is olive green with prominent patches of yellow down the neck and legs. As the name implies, the plastron (bottom shell) is mostly yellow with black spots along the edges. Adults tend to grow darker as they age. Yellow-bellied sliders are often confused with eastern river cooters, who also have yellow stripes on the neck and yellow undersides, but the latter lack the green spots characteristic of this species. The yellow belly often has an "s"-shaped yellow stripe on its face. They also have markings shaped like question marks on their bellies. The yellow plastron with green spots is visible in this view. Mating can occur in spring, summer, and autumn. 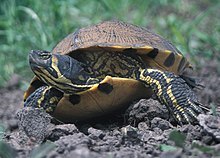 Yellow-bellied sliders are capable of interbreeding with other T. scripta subspecies, such as red-eared sliders, which are commonly sold as pets. The release of non-native red-eared sliders into local environments caused the state of Florida to ban the sale of red-eared sliders in order to protect the native population of yellow-bellied sliders. Mating takes place in the water. Suitable terrestrial area is required for egg-laying by nesting females, who will normally lay 6–10 eggs at a time, with larger females capable of bearing more. The eggs incubate for 2–3 months and the hatchlings will usually stay with the nest through winter. Hatchlings are almost entirely carnivorous, feeding on insects, spiders, crustaceans, tadpoles, fish, and carrion. As they age, adults eat less and less meat, and up to 95% of their nutritional intake eventually comes from plants. The slider is considered a diurnal turtle; it feeds mainly in the morning and frequently basks on shore, on logs, or while floating, during the rest of the day. At night, it sleeps on the bottom or on the surface near brush piles. Highest densities of sliders occur where algae blooms and aquatic macrophytes are abundant and are of the type that form dense mats at the surface, such as Myriophyllum spicatum and lily pads (Nymphaeaceae). Dense surface vegetation provides cover from predators and supports high densities of aquatic invertebrates and small vertebrates, which offer better foraging than open water. The lifespan of yellow-bellied sliders is over 30 years in the wild, and over 40 years in captivity. Baby yellow-bellied sliders may be kept in a fairly small tank (20 to 40 gallons), but as they age, after about three years,they will require much more space. One Adult may be housed in a 75 US gal (284 l) (or larger) aquarium. The turtles require enough water to turn around, with a depth of 16–18 in (41–46 cm) recommended. Water temperature should be kept between 72–80 °F (22–27 °C) and properly filtered. Keeping fish with turtles is usually avoided due to the risk that the turtle will eat the fish. Sliders need a basking area that is kept warm during the day and that will allow the turtle to move around, balance, and dry off completely. This area should average 89–95 °F (32–35 °C) and can be heated with a UV-A heat lamp. A second lamp that produces UV-B is absolutely essential for the turtle to metabolize calcium properly. Direct, unfiltered sunlight is preferable. The lamps should be switched on during daylight hours. Turtle tanks can be purchased at many pet goods retailers. Pond plants such as elodea (anacharisan) and cabomba can also be left in the water, while human-consumed vegetables such as romaine lettuce, escarole and collard greens must be changed daily. As sliders are omnivores, insects and freshly killed fish may also be provided for protein. Commercially processed animal-based reptile food may be given too, but any sort of leftovers should be immediately removed to prevent fouling the water or turtle's habitat. Ioannis Davidis Schoepff (1792). Historia Testudinum Iconibus Illustrata. Published in Erlangen, by Ioannis Iacobi Palm. p. 16-17. ^ Fritz Uwe; Peter Havaš (2007). "Checklist of Chelonians of the World". Vertebrate Zoology. 57 (2): 207. Archived from the original (PDF) on 2010-12-17. Retrieved 29 May 2012. ^ Conant, R., J. Collins. 1991. Peterson Field Guides: Reptiles and Amphibians of Eastern/Central North America. Boston: Houghton Mifflin Co.
^ Scriber, K. T.; et al. (August 4, 1986). "Genetic Divergence among Populations of the Yellow-Bellied Slider Turtle (Pseudemys scripta) Separated by Aquatic and Terrestrial Habitats". Copeia. American Society of Ichthyologists and Herpetologists. 1986 (3): 691–700. doi:10.2307/1444951. JSTOR 1444951. ^ "Yellow-Bellied Slider reptiles". Reptile Channel. Retrieved 2008-10-22. ^ "Care Sheet — Yellow-bellied Slider". Austin's Turtle Page. Retrieved 2008-10-23. ^ "Yellow-bellied Slider Turtle". Savannah River Ecology Laboratory, University of Georgia. Retrieved 2014-02-13. ^ a b c d e "Choosing a Yellow-Bellied Slider". Pet Place. Retrieved 2008-10-22. ^ Ochoa, Julio (June 30, 2007). "Red-eared slider turtles now on state's no-no list for pets". Naples Daily News. Retrieved 2008-10-23. ^ Morreale, Stephen J.; Gibbons, J. Whitfield (1986). "Habitat Suitability Index: Slider Turtle" (PDF). United States Fish and Wildlife Service. ^ "Yellow-bellied Slider". Savannah River Ecology Laboratory, University of Georgia. Retrieved 2014-06-08. Wikimedia Commons has media related to Trachemys scripta. Subspecies and the extinct (Gyremys sectabilis) are not included. This page was last edited on 30 March 2019, at 19:55 (UTC).